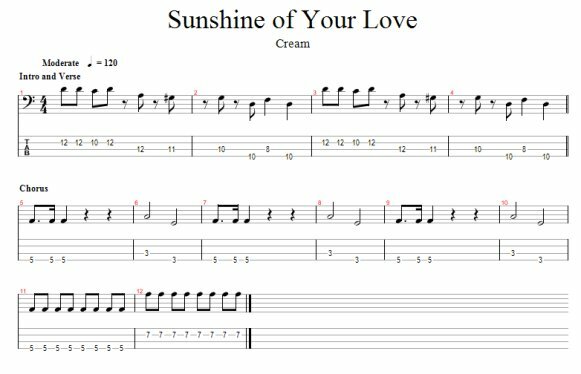 This tab is for "Sunshine of Your Love" by Cream. In order to fit the tab on this page, just the Sections (intro, Verse, Chorus) are tabbed. This free Guitar Pro bass tab is meant just to get you started. This song was featured on the 1967 Disraeli Gears album. It was written by Jack Bruce, Pete Brown, and Eric Clapton. This classic tune was Cream's first big US hit. In the US it hit #36 in February, 1968. The song also has the distinction of being Cream's only gold selling single in the U.S. If you are a "Guitar Hero", this song is featured on the 3rd version of the game. Jack Bruce was born in Scotland. Besides being one of the most innovative bass players in rock and roll history, he is also a classically trained cellist. The bass that Jack played during the Cream years was a Gibson EB-3. Some of the bassists who claim him as a major influence areSting, Geddy Lee and Jeff Berlin. While with cream, Bruce co-wrote most of the groups hits including "Sunshine of Your Love". Since leaving Cream in 1968, Jack has had a long Solo career and has participated in projects and tours with dozens of famous musicians. 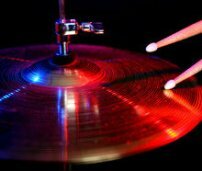 Here is the Free Bass Tab--Have Fun!